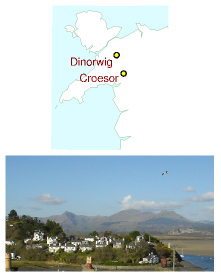 Croesor: Llyn Cwm-y-Foel, SH 653 466.
storage capacity of 514 GWh. 197In South Africa... demand-management systems are being installed. –Almost all of Denmark’s wind power is exported to its European neighbours. 198For over 25 years (since 1982), Fair Isle has had two electricity networks. 199Figure 26.13. Storage efficiencies. Lithium-ion batteries: 88% efficient. (2005); Lemofouet-Gatsi (2006). See also Denholm et al. (2005). energy density of 300 Wh/kg. (here, boron from boron oxide) will be inefficient in energy terms, and so will the combustion process. 201... summer heat from roads is stored in aquifers... [2wmuw7]. Figure 26.18. A possible site for another 7 GWh pumped storage facility. Croesor valley is in the centre-left, between the sharp peak (Cnicht) on the left and the broader peaks (the Moelwyns) on the right.